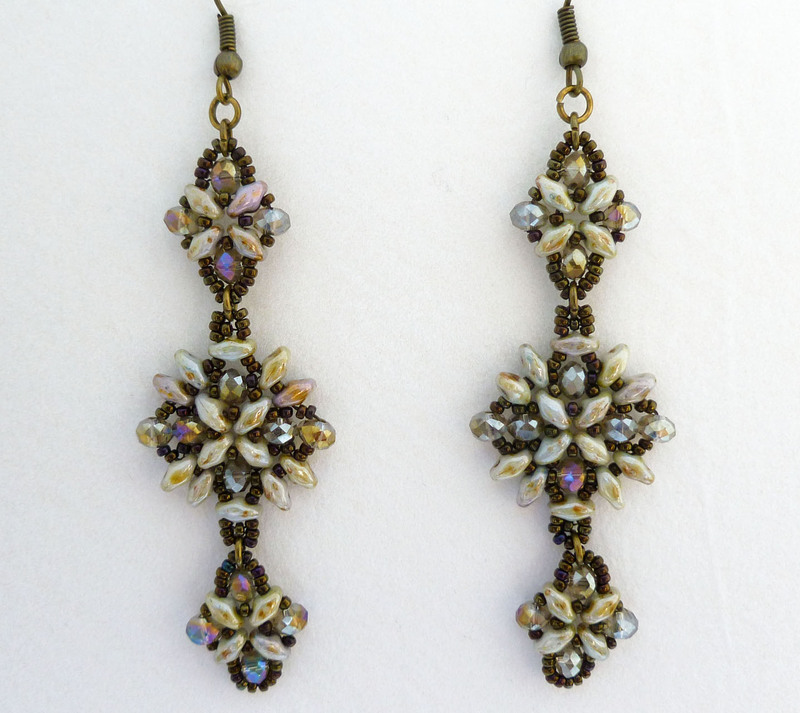 This simple and beautiful earring is designed by Nunzia Scalpore. She is Italian and has a channel on YouTube with a lot of amazing tutorials. The videos are in Italian, but I think it's pretty easy understand the pattern because she shows in the video everything you need to do. It's a good pattern for beginners and you can find the tutorial here. That's my last creation! It's a very simple pattern: the spiral rope. I'm finishing the video tutorial for it. 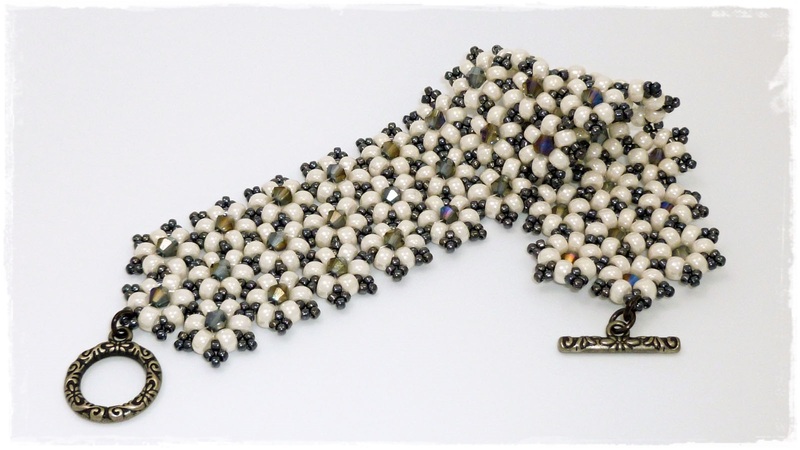 This bracelet was designed by Jamie Hogsett. It's totally made in circular square stitch. 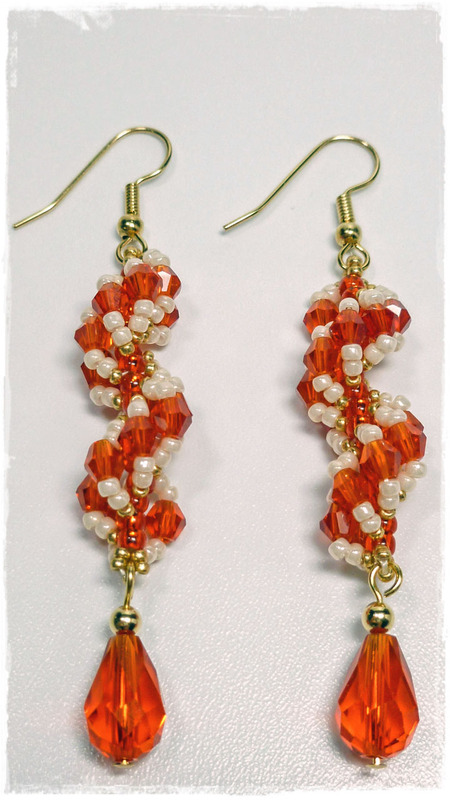 The tutorial was published in the Favorite Bead Stitches magazine. It's a very easy project and suitable for beginners. However, if you never tried the circular square stitch before, I recommend you try a smaller and faster project first. 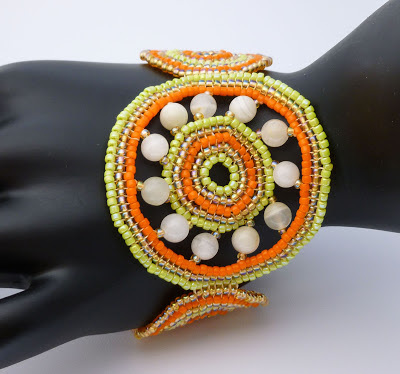 For this project I used dyna-mites seed beads size 11/0 in three different colors, C-lon thread size D, and 6mm round beads gemstone italian onyx for the center circle. This bracelet is an adaptation of the Kisaviragas Karkoto schema, designed by Panita of the Hugarian blog Panita Pearl Jewelry. It's a very beautiful and easy pattern. To complement our previous post about beading threads, I brought a video from Beadaholique, an online store of materials for making jewelry. The video is an overview about all the different types of string materials out there like threads, ribbons, cords, chains, and beading wires. If you have any question about the string materials presented in the video, you can send me an email or post your question in the comments. I will answer as soon as possible. 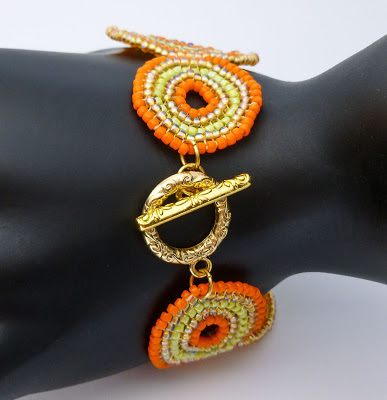 Usually the beads have a very small hole to pass through it several times with the needle, which makes necessary the use of threads designed specially for beadwork. 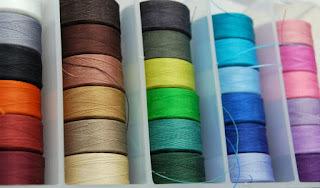 There is a great variety of beading threads. They vary in the type of fiber, thickness, resistance, color, and quality. The choice of the thread for a project is very important. If you choose a thread that is not strong enough, you can see a piece that you took hours or days working in it falling apart after a short time of usage. What you want is that your piece can last for years! Nymo is a lightweight nylon thread. It's strong, and has a slightly silky appearance that resembles a dental floss. It stands out for its low cost, and the variety of colors and thicknesses available. The thread tends to fray and tangle easily, so use lots of beeswax or thread conditioner to keep the fibers stuck together. 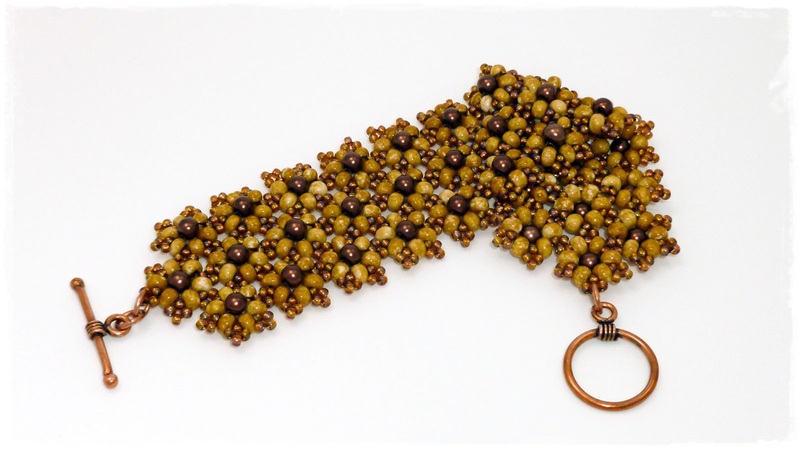 It also stretches while you use it, so it’s best to pre-stretch it before you start stitching. C-Lon is a UV-resistant nylon polymer thread. It has all the same qualities of Nymo, but is slightly stronger and durable. It also comes in a larger number of colors and has almost no stretch. As well as Nymo, the C-Lon tends to fray and tangle if not conditioned. 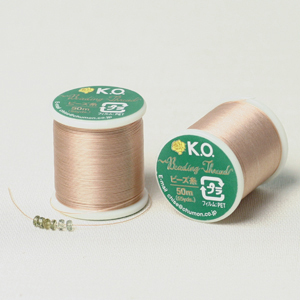 There are two types of thread for this brand: C-Lon Cord - designed for micro macrame, crochet with beads, and kumihimo among others; and C-Lon thread - designed specially for beadwork. The C-Lon thread is available in two sizes: AA (similar to Nymo size B) and D (similar to Nymo size D). This is one of my favorite threads. K.O. is a parallel filament nylon thread. It's very strong, soft, pre-conditioned, and resistant to fraying and tangling. It also has no stretch. Unfortunately K.O. hasn't a large number of colors. And it's available in only one size, which is comparable to Nymo size B. 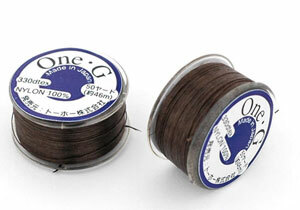 This is a Japanese nylon thread developed by Toho. It's very strong, has no stretch, and doesn't require pre-conditioning. 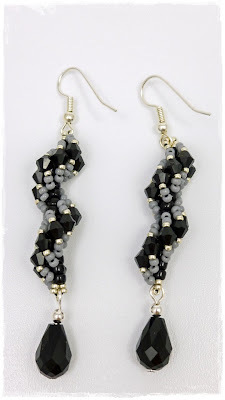 It's also resistant to fraying and tangling. I like very much of this thread because it's very strong, soft and pleasant to work with. The One G is available in only one size, which is similar to Nymo size B. And as K.O. thread, One G has a small number of colors available. The Fireline is originally a type of fishing thread that has become such a favorite among beaders. It is a synthetic thread made of gel-spun polyethylene material that is very strong and durable. And it doesn't fray and has no stretch. 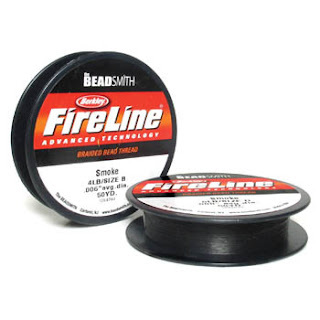 Due to its resistance, the Fireline is suitable for almost all types of project, especially if you use crystals, gemstones and other sharper-edge beads. Being polyethylene, the thread is stiff and harsh. Depending on the project, you may not even need needle. 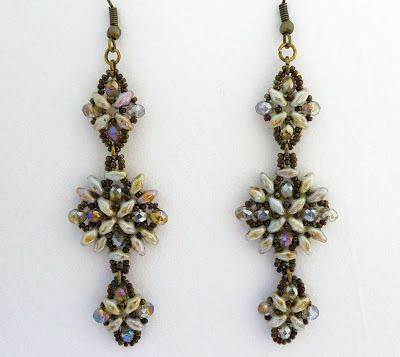 But, otherwise, its hardness makes difficult to cut it with embroidery scissors - and the thread can damage the scissor. If you do not have special scissors to cut harder materials, use cheap scissors to cut Fireline. The Fireline is only available in the colors smoke gray, crystal, and some neon colors. But to solve this problem, many people buy the crystal color and paint it with a permanent marker to match the beads. 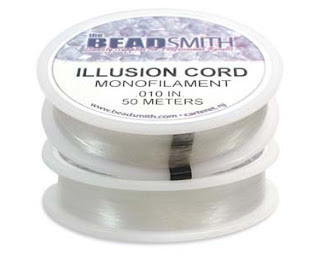 This is a nylon monofilament thread. It's soft, strong and has no stretch. 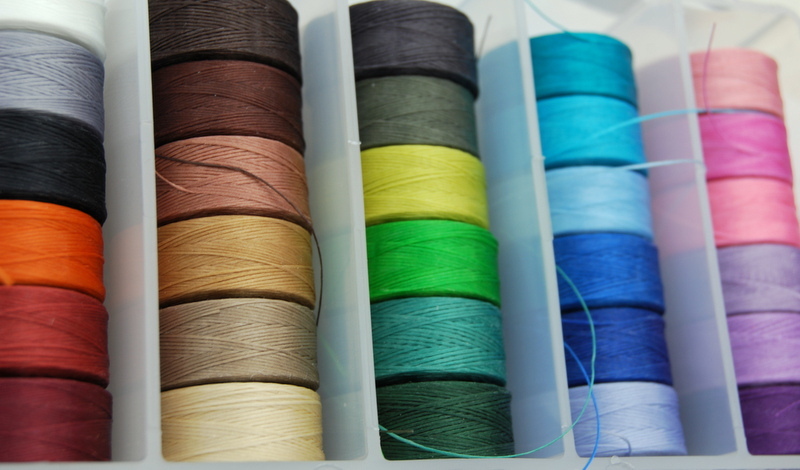 The clear color is totally transparent (hence the name "Illusion Cord"), being a great option when you do not want the thread visible in your work. However there is a black color version that is less strong and soft than the clear one. The Illusion Cord is available in three sizes: 0.006" (0.15mm), 0.010" (0.25mm), and 0.012" (0.30mm). There are many brands and types of thread other than those mentioned here in the post. The previous list is only to help you to understand a little bit about it. You should try different threads until you find those you like more. 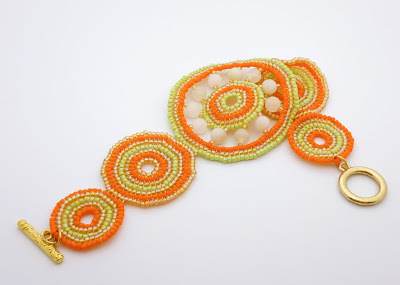 Factors you should always take into consideration when choosing a thread: the types of beads you will use (if they are heavy or if they have sharp edges that can cut the line) and the type of project.